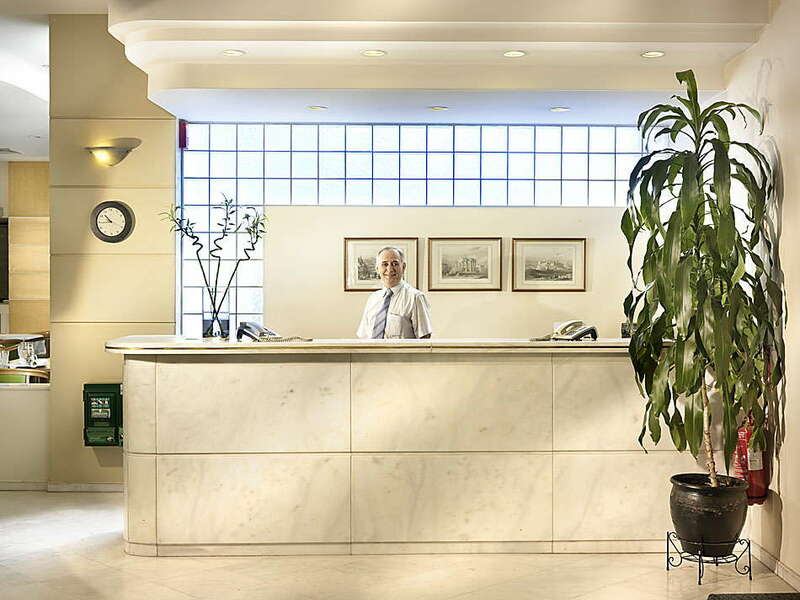 A budget hotel in every sense of the term, the Jason Inn is centrally located near some of the best ancient sites in Athens, with tidy rooms, effusive staff, and a pleasant rooftop looking out to the Acropolis. Don’t expect much more than that. The hotel looks tired and dated, and will soon require a refurb, but you can't beat the location nor the price tag. YOU SHOULD KNOW The rooftop restaurant has an intriguing panorama spreading from the Acropolis to the ancient Kerameikos Cemetery to the modern-day warehouse district of Gazi. Peachy is the first word that comes to mind, and it refers directly to the dated color scheme. 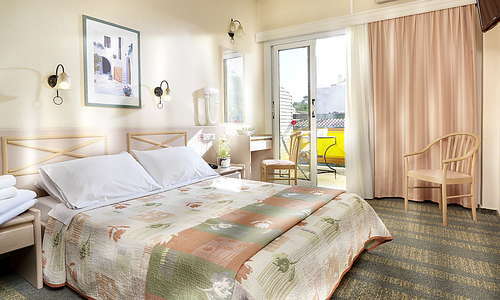 Small, boxy but well-cleaned rooms, some with threadbare carpeting and all with uncomfortable (by most standards) beds and basic amenities (including minibar). 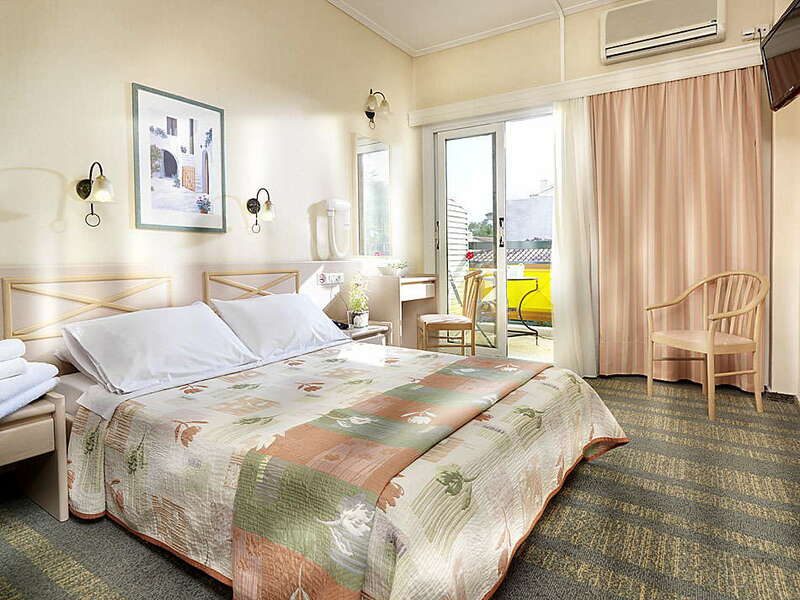 Most of the rooms have unattractive views like next door buildings but are OK for travelers who want a decent practical base while stopping (briefly) through Athens. YOU SHOULD KNOW Rooms on the 3rd floor can be noisy because of the action on the rooftop bar restaurant right above. Small, basic, also peachy and with the kind of toiletries you’ll tolerate for a day or two but would not consider slipping into your bag. 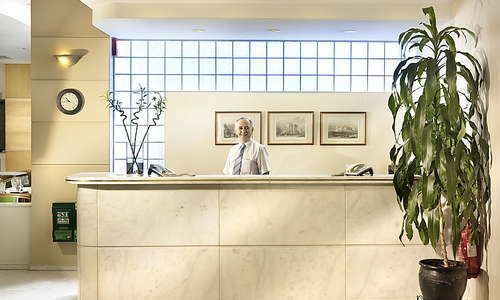 A white marble entrance leads to a no-frills and dignified reception desk in cream marble, behind which you’ll be welcomed by professional and helpful reception staff. Like the overall standard of this hotel, the breakfast buffet is adequate--you’ll find the likes of boiled sausages, eggs, toast, jams, yogurt, and a few cheeses and cold cuts. 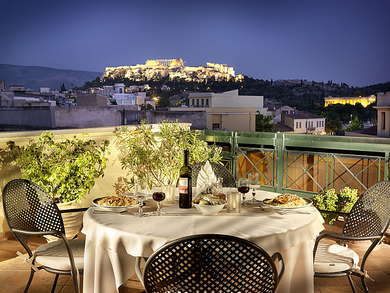 Its saving grace is that it’s laid out on the rooftop where you can take in a breath-taking (by general admission) view of the Acropolis at an arm’s reach. The hotel restaurant is fine for a lunchtime or dinner snack, but it’s probably a better idea to visit some of the superior restaurants just a stone’s throw away. YOU SHOULD KNOW The outdoor bar restaurant area is open from May to October before the action moves in the indoors breakfast room. The rooftop also has as a bar, where you can have a relaxing drink before calling it a day. 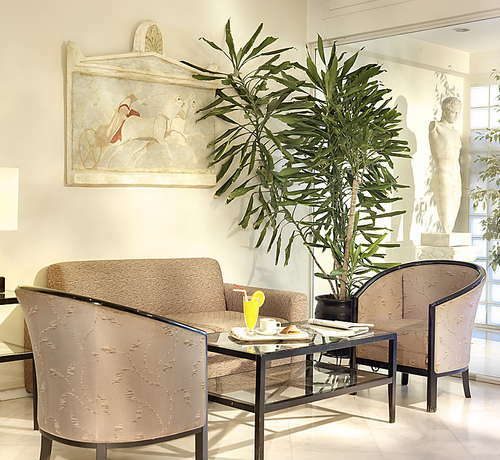 Jason Inn is steps away from the buzzing nightlife districts of Psirri and Thissio, not to mention the ancient Agora and the Acropolis further up the pedestrianized street. Round the corner from the Jason Inn is Thissio station, which at the next stop (Monastiraki) connects to the underground metro system and the blue line to the airport (around 45 minutes, €18 return or €10 one way). There is also a taxi rank at Asomaton Square (taxis to the airport cost €35). Not to be missed: At just a few minutes' walking distance on the lower part of Ermou St you can visit the ancient Kerameikos Cemetery, a huge expanse of greenery where you’ll see impressive burial statues and a small museum. The best restaurant in the area by far is Kuzina, which serves creative modern Greek cuisine (5-minute walk). For a more traditional-style set-up, go To Steki Tou Ilia (8-minute walk) which specializes in lamb chops, and for a romantic dinner with a view visit Chocolat Royal (5-minute walk). Thissio is just 10 minutes' walk up to the Makryianni area where you can find a top-quality variety of restaurants such as Strofi and Zonar’s. From the Jason Inn you can also walk down to the end of Ermou St, cross Pireos Avenue and find yourself in alternative Gazi, another busy area full of restaurants and bars. With areas like Psyrri, Monastiraki, Makriyianni, Petralona and Gazi just around 10 minutes' walk away in various directions there are innumerable options for nightlife, but nearby Thisseio too offers a good selection. The Underdog and Divino Wine Case are just a 5-minute walk away while Pikap is on the border with Petralona at about 15 minutes' walk. 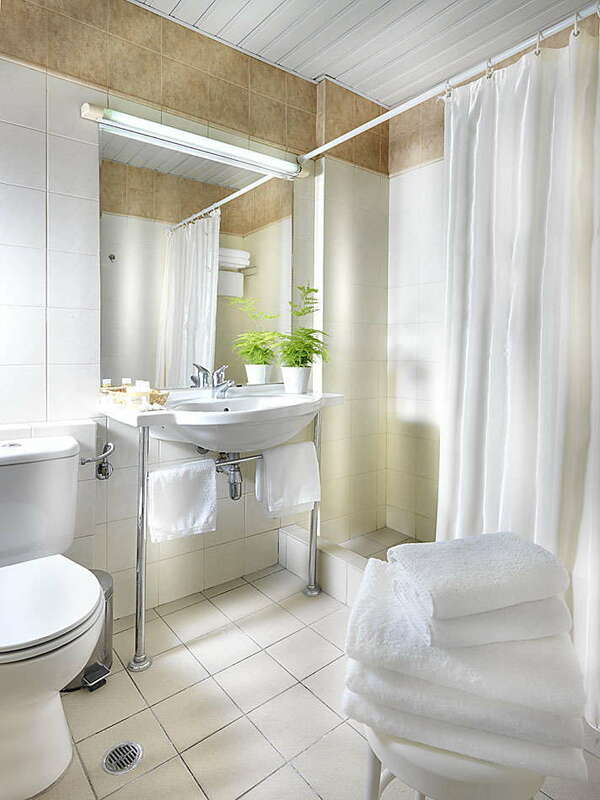 If your priority is to book a budget option, the essentials are all here--affordable prices for an excellent location, accommodating staff, complimentary breakfast, decent Wi-Fi, and cleanliness. The added plus is the excellent vista of the Parthenon from the rooftop. Unless you’re not at all fussed about deep comfort and style, this hotel will do just fine for a few days.